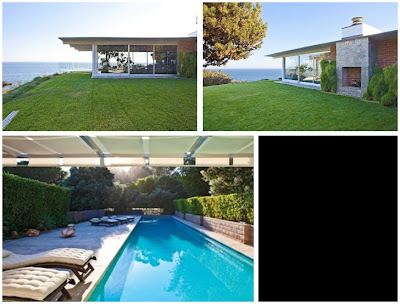 Way back in early 2009 the celebrity real estate rumor mill began to churn out the scuttlebutt about ex-pat Tinseltowner Brad Pitt wanting to unload his high-concept and very contemporary bluff-top beach house in Malibu, CA. At that time Your Mama heard through the grapevine the architecture and design loving actor wanted eighteen mil for the 1.26 acre spread that property records show he scooped up in March 2005 for $8,410,000. The real estate music quickly went silent on Mister Pitt's mid-century modern beach pad until late August 2011 when the property somewhat unexpectedly popped up on the open market with a $13,750,000 price tag. It wasn't long after this that Oscar-winning actress Reese Witherspoon took a tour of the tricked out residence. When the property was first put on the open market no photographs of the residence appeared with the listing. That changed yesterday when a small but fascinating cache of listing images were uploaded to the interweb that give a (too) brief glimpse into the rarefied world of Mister Pitt, his lady-mate Angelina Jolie ,and their 79 children, some biological and some adopted from various third world countries around the world. The images show an architecturally crisp structure with entire walls of floor-to-ceiling glass panels the living room that expose the room to breathtaking views up and down the California coastline and slide open to a deck cantilevered over the bluff top that tumbles steeply down to the sand. The day-core is decidedly spare, unnervingly expensive and about what one expects from a wildly wealthy design maven like Mister Pitt. However, much as we may swoon for the grossly expensive Vladimir Kagan Serpentine sofa, go giddy over the matte gold Arik Levy rock table (at least we think its an Arik Levy rock table), and shimmy with decorative desire for the pair of padded George Nakashima chairs we can't imagine this is the sort of room one might feel comfortable letting half a dozen rug rats run around in wet bathing suits with dripping Popsicles. What also concerns us is the over-sized Verner Panton capiz shell chandelier that probably requires a part-time staff person whose sole duty is to untangle the damn thing after an ever-present sea breeze or gust blows through the house when the sliding glass doors are pushed open. The all stainless steel kitchen–the nightmare of our fingerprint loathing house gurl Svetlana–has radiant-heated dark bamboo floors, a walk-in fridge/freezer, high-grade appliances, and a glass topped snack counter that divides the cooking and prep areas from a breakfast area outfitted with a modern version of a picnic table surrounded by a matching bench and a quartet of vintage Eames chairs. A glass and steel garage door slips open to merge the interior space with the grassy backyard area where there's a giant outdoor fireplace with flagstone chimney breast. Listing information shows there are a total of 4 bathrooms and 4 bedrooms in the house, two of which are currently utilized as office spaces, no doubt one for Mister Pitt and the other for Miz Jolie. The grounds encompass a tennis court near the gated tree-lined driveway and a lavishly long lap lane swimming pool ringed by high privacy hedges and and wide sunbathing and entertaining terrace. The property comes with access to the beach via a long staircase and pathway that zig-zags down the bluff. Your Mama is certain that by the time we took the time and made the effort to scamper down the bluff we'd lose interest in the beach and have to turn right around to make the glute-busting climb right back up to the house. Some of Mister Pitt's nearby neighbors also have their ocean front homes on the market. Hulking actor Brad Garrett has the faux-Spanish villa perched on the Encinal Bluffs he bought in January 2007 for $8,814,500 on the market for $12,950,000 (reduced from $13,950,000) and Malibu-based architect and designer Michael Lee has Elephant Rock–a dramatically sited stone-built house overlooking Matador Beach–currently listed with a asking price of either $14,950,000 or $26,500,000 depending on where one looks. The bottom of the long stairs probably smells like pee..
LOL at your description of this one Mama...especially the comment about the capiz shell chandelier "maintenance"...! "...their 79 children..." Tell me this is a joke, Mama. I fear it may not be. Yeah, it's not really the kind of place you want kids running around or the kind of place kids want to run around. And it doesn't sound like there's that much room. What to do? Rent a couple of deluxe RV's with cool kid decor for the lil monsters & nannies. Park em on the driveway. It looks big enough for a couple of adults & guests, but I assume the space issue is why the listing says "Planning and Coastal approval for additional 2nd story." He stared at the bottle of sleeping pills, the crickets from the lawn incessant in his ears, the moonlight making strange shadows across the Hockney hanging over the headboard. The last "masterpiece" was a huge bomb, the one before that, poorly reviewed, and she was pregnant.....again. 8 million to 13 million in 6 years? In today's market? I think you would need to be a big fan in order to plunk that much cash down for the place. Seems too steep to me. I love that it's a clifftop home above and beside the ocean rather than one level with the beach. Lots of floor to ceiling glass walls on the ocean side allowing in the full splendor of the view is perfect too. The linked Reese Witherspoon article mentions that she liked this one best of the several Malibu homes she toured that day. I don't blame her and bet it's as good as sold if she and Brad can agree on a price. Yeah Witherspoon could keep fit by running up and down to stairs to the beach and not have to worry about old ladies knocking her down (not up) on the street. Gotta love the million dollar view.....or 5 million dollar view, depending on how you look at it. At least this place is trying to take advantage of the scenery. They fled, only to turn back and see all they had...all the ill-gotten treasures rapidly consumed by the ragged hordes like roaches over carrion....everything was picked clean in seconds, the burning lumber frames of their mansions splintering and sticking up into the blackened sky like the broken bones of a great, once-powerful animal whose death has caused it to let out a long, heavy sigh. An era had come to an end. That guy on "Selling LA" has just been awarded a wildcard into the Rainbow Plastic Surgery Open. I love that Mr. Pitt And Ms. Jolie took strains to keep the architectural era of this house when redone after they purchased the home. This is like stepping into another era.. when the house was just built. Great Specimen if the right $$ buyer presents themselves. Anon 8:36. AMEN!! I could NOT even watch that show. He mutilated his face. I only hope he didnt do it because of an accident (reconstruction), as that would make me feel bad. I watched 15 min and had to shut it off. The other agents and clients were boring too. Typical CA trash. Nearly $14m for a house with no central a/c. Really?! He's asking too much for it in this RE market. View is nice, probably not a great need for a/c once you open the windows but still. Too much and too small for Malibu. Reese looked at this property weeks ago and didn't want it.